I don't think I've ever discovered quite as many amazing brands before as I have since switching to green beauty. Perhaps it's because the formulas are chockfull of all natural, highly effective ingredients without any preservatives, or maybe it's because each brand was started by a lovely person whose love of skincare shows through their products. Whatever the case may be, I am so happy to have made the switch because it's led me to meeting such beautiful brands. One such line is Isa's Restoratives, a wonderfully innovative brand based out of Brooklyn, NY. Not only is the brand packaged in gorgeous glass containers, but the line holds some of the most unique and clever products I've ever come across. For the past few weeks I've been trialling a few of these gems and I'm so excited to share a little more about them with you. First up is the line's Liquid Clay Cleanser*, a truly one-of-a-kind gentle cleanser that contains ingredients you won't find anywhere else. Housed in a very generously sized 4 oz bottle, this cleanser is made up of ingredients such as French Green Clay, Volcanic Ash Clay, Alchohol Free Witch Hazel and Green Tea Extract. I apply it with my fingertips, massaging it into my face before wiping it away with a cotton pad, followed up with a splash of warm water. For a clay-based formula it is surprisingly gentle, leaving behind seriously clean (but never dried) skin. The French Green Clay is a really awesome ingredient, as it removes skin impurities, stimulates blood flow, tones and refreshes all at once. I've used it before in many soaps, but had never seen it in liquid form until I came across this seriously dreamy product. It's a testament to how creative the brand is, and was an immediate indicator that I was going to love everything they did! 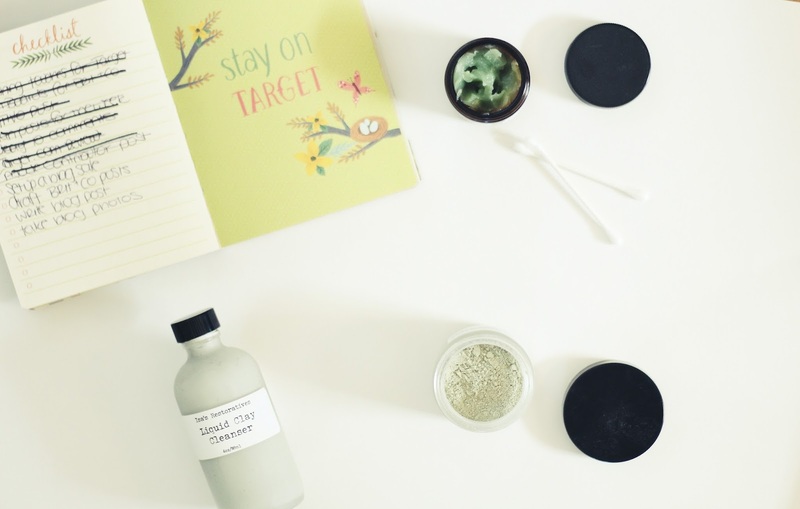 Another truly cool formula comes from the brand's Matcha Facial Mask*, a combination of ingredients like Matcha Tea, French Green Clay, Chamomile and Calendula. For those that don't know, Matcha is a finely ground powder of specially grown and processed green tea, which is known in the health food world as a bit of a superstar. I've heard numerous rave reviews from people who drink Matcha, and was very curious to see how it would perform when applied topically. Matcha has a high chlorophyll content which contains anti-inflammatory and healing properties, essentially calming red and irritated skin. This powdered mask can be combined with a bit of water and left on your face for about fifteen minutes, after which you will find yourself with seriously smoothed and soothed skin. I was truly impressed with this mask and have been using it as an end of the week pick me up each Sunday night. It really helps rejuvenate my skin and give it a little bit of healthy color that it's usually lacking. If you hadn't heard of Isa's Restoratives before, I implore you to check them out. Each and every piece of skincare in the line is so well thought out and effective, and I have been more than impressed. I cannot wait to try more from the line and, in particular, I have my eye on their beautiful Elixir I which just sounds dreamy! Be sure to check out the line on Facebook, Pinterest and Instagram to keep up with all of their new goodness!